Beach Cities Real Estate provides Real Estate Services for all the beach communities located from downtown San Diego up to the Monterey Peninsula area near San Francisco. Beach Cities Real Estate Broker David Schwartz opened Beach Cities Real Estate on the famous “Del Mar” main street in downtown San Clemente in August 2000. His vision of creating a local company with premier marketing and customer service was soon formulated in the creation of Beach Cities Real Estate, Inc. David's past experience while working at Coldwell Banker in Capistrano Beach provided the frame work for the company and soon learned the value of premier customer service. He found that homes could be sold easier without going through the various corporate channels that exists in large brand name Real Estate companies. The creation of Beach Cities Real Estate with a focus on selling beach properties along the Southern California coastline was a huge success and to date have sold well over 200 million dollars worth of real estate. Beach Cities Real Estate niche is understanding the value of the Internet in marketing beach homes here in Southern California. In Today’s Internet Age, the once proprietary Multiple Listings Service (MLS) homes-for-sale data has been sold to almost every online real estate website’s which gives consumers full access to the real estate data. Because of this, the need for advanced Internet marketing is at an all time high. On average, roughly 85 - 90% of consumers first start looking for properties on the Internet. It’s important to choose a company that understands how to use the Internet to sell your home. Beach Cities Real Estate is proud to be an independent company that offers cutting edge technology along with outstanding customer focused service. We can be reached at 949-302-4995 and Toll Free at 1-888-990-7111 or you may contact us via email. 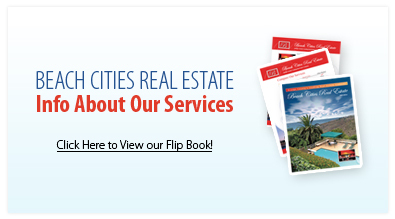 Beach Cities Real Estate is dedicated to providing outstanding service that is second to none. Our Associates understand the use of professional photography on all properties, the importance of IDX submission for Nationwide Exposure and using the Submission of the Multiple Listing Service to populate to over 1,000 different Internet websites. See our testimonial page and see what our clients think of our service. We are well connected with other Real Estate professionals in the area to properly promote the sale of your property through professional brochures, online email marketing of your home, just listed campaign to local buyers in the area as well as promoting your home to our staff of agents. We're excited to help you with the sale or purchase of your home by the beach! Please contact us at your convenience.